We’d love your help. 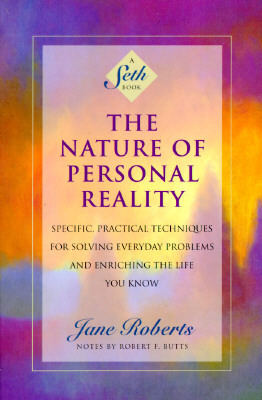 Let us know what’s wrong with this preview of The Nature of Personal Reality by Jane Roberts. To ask other readers questions about The Nature of Personal Reality, please sign up. You know the old question: if you were on an island and could only have one book, which would it be? For me, THE NATURE OF PERSONAL REALITY. I've been studying all manner of faith and religion for years, and this book and the work of Jane Roberts and Seth is the cornerstone of my personal belief system. This is (was?) the single most important book in my life because it came to me when I was a teenager and gave me the idea of the possibility of becoming alive. It is filled with odd sounding exercises that, when done, confirm the veracity of the 'far out' ideas presented by Seth. Once read, the ideas here changed forever and for the better, how I perceived, and how I was able to perceive, life. One of the most important books of the century... or any other. Trust me. If I could buy everyone on the planet one book — it would be this one! It is the "how to" create your ideal reality guide. We have the power of gods, but much of what we are contributing to has already been created. Our world is mostly—second hand—physical solid mass. A mass creation stays in place by our attention to it, rather than using our imagination to create. Seth explains all creation —springs up— from within us. One of the tips given by Seth was to built a "mental city" orbiting outside If I could buy everyone on the planet one book — it would be this one! It is the "how to" create your ideal reality guide. We have the power of gods, but much of what we are contributing to has already been created. Our world is mostly—second hand—physical solid mass. A mass creation stays in place by our attention to it, rather than using our imagination to create. Seth explains all creation —springs up— from within us. One of the tips given by Seth was to built a "mental city" orbiting outside of Earth's gravitational pull, which speeds up the enhancement of the creation, by creating without having to go through matter. I built the city above my son's bar in Chico, California with the goal of enhancing his reality. I go there every day to meditate on an ideal reality. I do this by "believing in what I cannot see". I focus hard, then rest for a fortnight, (14 day) repeating. This creates a WAVE in the quantum field, which creates what we call our physical reality. I named the quantum city after my son, "Michael's Quantum City." It orbits with Earth. I gave it to my son as a Christmas gift. Can you imagine—his face when I handed him an Invisible Quantum City—above his night club. Below is the gift description. It is open for anyone to meditate in. Tonight, one year later I re-ordered "The Nature of Personal Reality" to take on a trip to Italy with my husband. We are going to a small village in Latina. Each time I re-read this book I learn something new, like this quote, "Perfection is a closed in box". I am not looking for perfection, but rather making sure that each step I take is ideally suited for the outcome I wish to achieve. Love, Kelly Granite Enck, author of "From Hollywood to God" the story of my seven year journey around the world in search of god and a husband. During this I learned about the raw food diet, which was easy by comparison. :) Join me! Hard to discuss this book without being perceived as a loon. Suffice it to say that this book, along with Seth Speaks, really changed my worldview on...everything. It's a difficult read but one I highly recommend for those with an open mind and a desire to understand the true reality of physical reality. 'nuff said! This was the book that made the world make sense for me. When I was first introduced to the spiritual journey this was the first book I was given and it changed everything. This was fundamental in my philosophical development. Whether you believe the spiritual aspects or not, there were some good fundamental practices ensconced in it's pages. This is another interesting book of the Seth series which gets quite deep in describing aspects of our consciousness. It is not a light read and is in fact a book I can only read in small doses, but it is pretty incredible nonetheless. This is the type of book that you can flip to any page and find something profound. I read this book twenty- five years ago and I am rereading it. It was and is a marvelous piece of writing. The author seems to move aside and let the entity Seath speak through her and the voice is clear. Reading this book sharpened my isolated view of reality to the point where I've begun to question the meaning of small objects in the periphery of daily life. Not as comprehensive as Seth Speaks, but definitely a necessary read. Buy it. Read it (pencil in hand). One of the best books I have ever read...The exercises work! This is one of my favorite Seth books! Techniques to create the reality I want and desire. This book has been a lifelong companion. I first read this when I was in my 20s, and it blew me away. It changed the way I looked at everything. This book made me think about life differently. I found it uplifting and inspiring. I couldn't read it quickly; I had to stop often to think about what I was reading and how I felt about it. I've had to read this over and over again to GET it.I think it will be a book that I will have to continue to read as I mature and will get more out of it as I grow in my spirit. Another great Seth book. Really good for information on the nature of reality. The wisdom imparted in this book is definitely a keeper ~ and not just in this lifetime. You can't come up with a better description of this book than the subtitle: "Specific, practical techniques for solving everyday problems and enriching the life you know." Used to be a favourite, now I think it's a load of purposely confusing, channeled crap. I have nothing against Jane Roberts, I think she was sincere, but Seth is another matter altogether. Before you read this try The Siren Call of Hungry Ghosts: A Riveting Investigation Into Channeling and Spirit Guides by Joe Fisher. Now that's an enlightening read. I've been on-and-off obsessed with the Seth Books for about 15 years, but this is one I own and just can't finish. Or, at least I can't read it cover to cover. It's, like, way over my head, dude. Anyway, I'll continue to do what I've been doing since I bought it 10 years ago - pick it up and take in a few pages to ponder at a time. Totally, utterly fascinating stuff. Remove the new-agey spiritual mumbo-jumbo ("Perfection is achieved, not when there is nothing more to add, but when there is nothing left to take away." --Antoine de Saint-Exupery) and this is an extraordinary helpful book! It deals with several themes close to NLP ideas of managing beliefs and states, and touches even on submodalities. This has proven to be one of the most influential books in my life. Ever. This is one of the best metaphysical books I've ever read. It took me over 2 months to read it because I'd go to a coffee shop to read it, but I'd almost invariably read one or two or three pages then have to stop and reflect on it, how it applied to me, how it explained my past, what new possible future avenues it opened for me. I can't recommend this book highly enough. This book informed my thinking a lot recently, particular the chapters on creating new beliefs. I started seeing things around me through the lens of Seth’s teachings, for example, how others’ beliefs in the difficulty of something in life are actually inviting and reinforcing that difficulty’s reality, and how in other cases deficient self-worth could manifest as health trouble. I spent time doing the visioning practices to create new fundamental beliefs for myself, which seems to have worked w This book informed my thinking a lot recently, particular the chapters on creating new beliefs. I started seeing things around me through the lens of Seth’s teachings, for example, how others’ beliefs in the difficulty of something in life are actually inviting and reinforcing that difficulty’s reality, and how in other cases deficient self-worth could manifest as health trouble. I spent time doing the visioning practices to create new fundamental beliefs for myself, which seems to have worked well; I even accelerated the process of new-belief-installation itself by putting in a belief about that. I.e., “I can rapidly change my beliefs...” :) Unfortunately I wasn’t able to manifest a cure for my cold, but the perspective shift did help me enjoy it more. I also had some good discussions with friends centered on ideas of how beliefs affect reality, and how mistaken/unexamined beliefs we've taken in can affect us negatively. There are some common ones. For example: I did X, and about the same time, another person did Y, or else Z happened. Therefore, my egoic mind concluded that Y or Z was because of me. It’s so easy to take things personally! Another example which a friend brought up from her own belief investigation: There’s the idea that “Good things happen to good people, and bad things happen to bad people.” Therefore, if bad things happen to me, then I must be a bad person. How many of us have fallen for that one? The chapters focusing on the above ideas (15 and 16) alone are worth the price of reading of the whole book and can be read independently, too. Another beneficial technique is to remind myself and meditate on, that as Seth says, “The Present is the Point of Power”. It's a self-empowering meta-thought, a reminder that we’re choosing the thoughts from which our reality itself is constructed. Maybe the reading would have been smoother as a stand-alone without the inter-session commentary by Robert? But I started appreciating this layer. It grounds the Seth reality within a context, or a portal through which Seth’s book is made to feel more real. We can imagine sitting there and observing the sessions, and Seth also comments on then-current events. Finally, perhaps you’ll need to suspend your disbelief at times when confronting ideas about how far we’ve believed ourselves into certain predicaments. (E.g., the commentary on health foods and medical practice.) This is well worth doing as it allows the whole work to come into focus. Roberts was born in Saratoga Springs, New York. After attending public schools, she attended Skidmore College. She wrote in a variety of genres: poetry, short stories, children’s literature, and novels. When she was in her 30s, she and her husband began to record what she said were messages from a personality na Librarian Note: There is more than one author in the GoodReads database with this name.